Every now and then, I will receive the "Hostiles Detected" notification when I am nearby a planet and I will turn around, land, and wait for the hostiles to pass by. This situation is no big trouble at all when attempting to avoid a battle, but there are also times I will receive the notification when I have been warping into space and I am nowhere near a space station or planet. When I am in the middle of nowhere - aside from reloading the last save or destroying the enemy ships - there is not much I can do to avoid the fight as I am unable to active my pulse engines when hostiles are near by. When engage in a space battle, are there any tactics to avoid the battle all together? Once you get the warning for hostile scans detected, you can warp to a different system before the pirates arrive and avoid battle that way. Granted you will need fuel in your hyperdrive ready and if there was something of interest in that system you can always warp back. There is no apparent way to leave a dog fight mid battle, but if you are fighting in a wave because (for example) you attacked a ships cargo then the only way to get out of it is to fight the first wave and to then warp to another solar system or try pulsing to a nearby planet or space station. To help win the first wave you should always carry titainium with you so that you can have your deflector shield at all times during the fight. If you are just in an ordinary dog fight with no waves then there is no way to flee the scene unless you either die or destroy them. 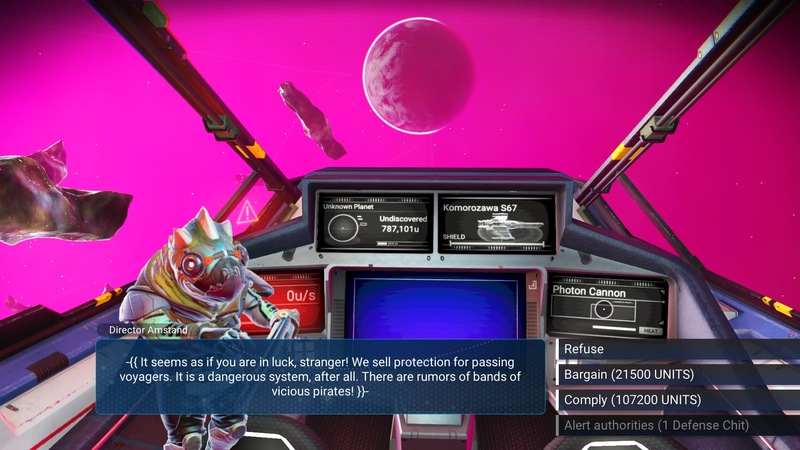 Another TIP if you don't want to end up in as many dog fights is to not carry valuable cargo not your ships inventory, this also means that there won't be as many pirates coming to attack you in the actual dog fight itself too if you have your valuable cargo in your suits inventory. Unfortunately, as the game currently stands, kind of? There really isn't a way to get away from pirates, unless you are very lucky and happen to warp in close to the system's Space Station or close to a planet. You may be able to warp to another system before the pirates spawn in, but you will need a warp cell in your drive to do so. (Thanks to VanBuzzKill for this, it totally slipped my mind). Unless the developers decide to add different ways for us to escape (which is just speculation, nothing confirmed) then unfortunately the only thing to do is fight. The enemy ships always seem to be faster than you, and can easily catch up. As of the Atlas Rises update, there was an update not mentioned in the release notes that allows you to (in)conveniently avoid space battles. When hostile ships are detected, you have an option to intercept communications. This window is only a few seconds, but if accepted, you given the option to pay for safe passage from the hostile ships. Refusing prompts the space combat, where as bargain and complying allows you to pay the pirates to avoid the hostile encounters. What are the differences between the options when accepting communication with hostile ships? Does carrying valuable cargo increase odds of being attacked? Can you destroy a space station in No Man's Sky?